Fiji : little sandy islands you think you want to be stranded on, especially one of Fiji’s party islands. Flying foxes (big fruit bats), drape themselves over the branches of breadfruit trees, then erupt in a storm of bickering. Frigate birds cruise low over waves that break on offshore reefs, prowling for chartreuse snack fish. Palms dance like swaying hippies along the crests of ridges in the islands’ interior. Shells with designs as intricate as Afghan carpets wobble up on the white sands. 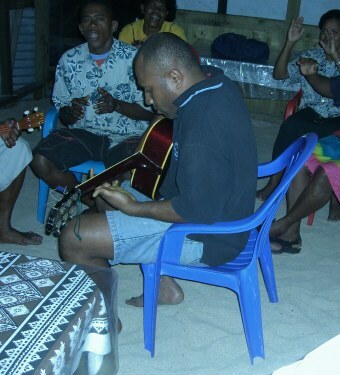 People dip coconut shells full of kava to drink on front porches, and sing in three part harmonies. They invite a lone white man to join them to talk and eat. These are important flavors of a Fiji experience that many people never taste. Some tourists only go to the tiny party islands, and though the heart and soul of Fiji is utterly lacking, they look to be exciting places: like Chuck E. Cheese; like a Singles’ Bar. Other visitors make it past the party, but seek safe haven in up-scale resorts, insulators from real exploration. Their memories are legitimate, their experience something less than rich. Then there are places like Sea Spray, and Adie’s Place – the Fijis I sampled – dissimilar, but sharing something. In a way it’s that shopworn and trivialized spirit of “Bula,” co-opted, adulterated,and tirelessly sold by the tourist industry as the national slogan. “Bula” is, in fact, the ubiquitous word of greeting and friendliness in Fiji, and, grudgingly, I must admit that it describes the people well: utterly decent – their friendliness sincere, their generosity beyond question. Where I went, everyone revealed these qualities. 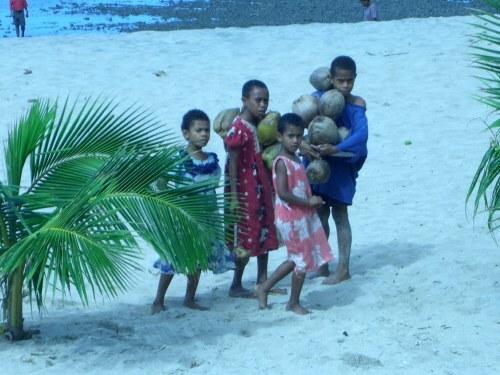 My time in Fiji began in the village of Savsavu on the island of Vanua Levu (Levu means island). I had endured LAX, the airport embodiment of federal lockup. I had eaten every sad meal on board the 747, even when I wasn’t remotely hungry, because eating is an event, a means of squandering time. A peach slice and smear of cinnamon on my pancakes brought me near tears. And just as one meal had become less vocal in my twisted G.I. system, another wave of food would have me excitedly unhooking my little tray. From Nadi, on Viti Levu, Fiji’s largest island and often referred to as “the mainland” by more remote islanders, I rode a 16 seat single-prop to Savusavu. I was to meet three friends (all of us are in what is charitably called middle age), who had sailed the 42 foot ketch, Renicka, from Pago Pago in Samoa to the Copra Shed Marina on Savusavu’s bay. They motored in towards evening, and I could see from a distance that spirits were not high. It developed that the two friends acting as crew had translated the attitude towards them of friend and captain, Fred, in patently negative terms. There was a mutinous mood, a hovering anger asea. En route, a storm had blown a hole in the mainsail and broken a thing called “roller furling,” on which the jib is wound, compounding the ill will and complicating steering the boat from that point on. Joe, an old friend of mine from high school, had dreamed of a South Pacific passage, whetting his appetite in years of sailing Roethke I and II, his own crafts, around Lake Washington and through the San Juan Islands and north into Canada.. Dennis, a close friend for almost 30 years, had made the passage as a favor to Fred, but his true goal, as mine, was to prowl the reefs and beaches, mountains and deep blue atolls of this glut of islands, as far away from organized volleyball games as we could get. We assumed this could be done on a large sailboat, ignoring its slothful eight or nine knot speed limit. Although the rancor ebbed a bit, the time at Savusavu kept growing, the expected three days stretching into eight while waiting for a new Zodiac shore-craft to arrive. We were docked sailing bums, making impromptu parties wherever we went, Dennis practicing guitar diplomacy and me pulling my alto sax out occasionally. The lovely Japanese family who operated the restaurant at the Copra Shed, tolerated an imposed intimacy with the somewhat unkempt and barbarous four of us. We gave the father a slab of mahi mahi which the boys had caught en route, on the condition that he cook us a gourmet Japanese meal with some of it. He brought us an incredibly varied feast, really beautiful food. The town of Savusavu is appealing, a single main street of shops and restaurants along the bay with a large farmer’s market, a hospital and mostly well-kept homes. The people, as unaffected as ever I have seen, treated us as friends, failing to hate us for having more in our wallets than an annual Fijian salary. We drove into the mountains to a national park and short trail through jungle filled with fruit bats, huge “barking pigeons” and basketball-size black globes of fruit growing parasitically on available trees. 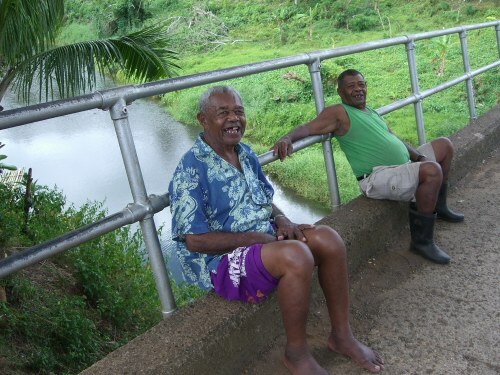 We explored the island, visiting the East Indian dominated community of Labasa, where a strike of sugar cane workers left at the gates of the mill an endless queue of trucks, loaded with great “afro” hair-dos of cane stalks. We snorkled at a place called “split rock,” east of Savusavu, sharpening our appetites for well-populated, healthy reefs, and we witnessed the incredible violence of rugby at a field near Savusavu. And we had kava, the national beverage of Fiji. Dried roots of the kava plant are ground to a powder, the powder sprinkled into a piece of cheesecloth. Then water is poured into it, and it’s squeezed and sifted into a mixing bowl, which also contains water. When the kava tea-bag is spent, one person hands out half-coconut-shell bowls filled with the grayish liquid. The recipient claps, then drinks it. It’s a mass sharing of saliva, lip sores, bacteria and back wash. It tastes like dirt, the pure kind from the empty lot you sampled when you were a kid. Good kava numbs the tongue, then distributes good will. Kava drinkers are relaxed; we never saw angry or inebriated kava drinkers. The four day trip from Savusavu to Vuda Point, near Nadi, where the boat would live for the next year, was one day sailing and three motoring. The only noteworthy experience was a storm at a modest village on Vanua Levu, home to several state-of-the-art windmills and solar panels which, having arrived without instructions or tech support, are just decoration. Three of us were rowed ashore and later back to the sailboat by two fisherman, whom we ironically paid with a fish, a 20 pound yahoo we had caught trolling. The storm was launched while we were ashore, and our return trip kindled some terror, the small rowboat a mere toy in the growing seas. After all-night watches we made a break southwest across the Bligh Water to Viti Levu, a sail of about ten hours. For two more days we motored along the coast, notably devoid of beach or reef fun. At Vuda Point, Fred was consumed with repair, docking, and insurance concerns. Over curried chicken necks and mutton and goat bones in Nadi, the three of us decided to ride a tourist boat called the Yasawi Flyer to the Yasawi Islands, a line of dots that look like they spilled off the brush when painting Viti Levu on the map. A day later, as the three-story power boat wound through islands for several hours, dropping off and picking up passengers at resorts, anxiety’s hold weakened – this looked like the magazine Fiji. At Nanuya Lailai, a small island near the north end of the Yasawas, Seaspray resort’s greeter and emcee, ‘Queen,’ showed us to our bura, a simple, clean elegant grass hut. Over lunch, Queen regaled us with stories of his happy times with John McCain, Liz Taylor and Oprah when he worked at the Turtle Island Resort on the adjoining island of the same name. Turtle does cost some $1,500 per night and attracts celebrities, so who knows? 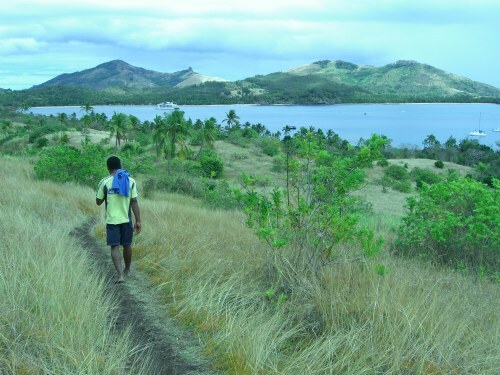 Nanuya Lailai is less than a mile across, and a trail over it’s spinal ridge is a lookout over soft forests of palms and mangroves and adjacent islands. The path connects the island’s less elegant east side resorts, run by a single family, with Blue Lagoon Beach (as in the movie) and the Nanuya Island Resort. Your own personal beach can be chosen from a host of little niches separated by volcanic outcroppings. Happy Hour is at Kim’s Place, a neighbor resort where lovely Annie and her beautiful mother, Andy (or maybe the other way around), serve beer at what looks like a kid’s lemonade stand. At Seaspray, dinner follows a prayer and precedes music. We are served with a flourish – the second night some very fresh rooster we had heard a little too early that morning. Then comes guitars, a lightning-fingered ukulele player, clapping. Voices, quickly adjusted to pitch and fell into very tight harmony. The songs bounce along smoothly like Hawaiian music, but have something else, a plaintive quality and raucous shouting mode, evoking maybe African influence. Queen and La, a woman who also worked at the resort, soared in song. Seabreeze’s manager, Frank, and the rest of the staff, Luci, Kefi and David found the necessary alto, baritone and tenor slots. Scones and pancakes with a side of pineapple and papaya are often breakfast. After that, there’s a lot that needs to be done. One needs to read by the beach in the sunshine, swim in warm, crystal blue waters, dive on the reefs, explore the island, and prepare for lunch. One might watch women fishing in water up to their chests with hand lines, biting the heads off their catch before flipping them into a bucket. Octopus hunters poke their quarry with sticks, then wait for at least six tentacles to engage their arm before extracting them from the rocks. Off shore, small boats carry teams using 40 foot hand nets surrounding small schools of fish. I figured there probably was a way to tap the cistern at Seaspray, but I didn’t know how, so I went to get the shower bucket La had explained. Walk next door to the well, drop the bucket into the well, pull up water and pour into the shower bucket. Then take the shower bucket back to the shower stall, dip into it with the shower cup and pour the water over your body. The well bucket dropped and came up empty – several times. Finally I tried dropping it upside down. It filled and I began the process. So it goes at Seaspray. It’s not all that fancy. At Seaspray we were managed. It wasn’t uncomfortable, but I didn’t feel quite as anonymous as I like. At meals, I often felt compelled to make small talk, although it was easier when Peter and Jelena(of Belgrade) and Frank and Wolfie, from Germany showed up to absorb some of the attention. Oh so wrong. Adi’s Place was exactly my first choice. Adi’s daughter, Tema, welcomed us pleasantly, without fanfare, then served a hot lunch of stir-fry. She was good-natured and helpful, a great and accommodating cook (just-caught fish for dinner, hot homemade bread at breakfast), but let us make our own discoveries on her large island. Even an introvert like me enjoyed connecting with the local people in this secure environment. 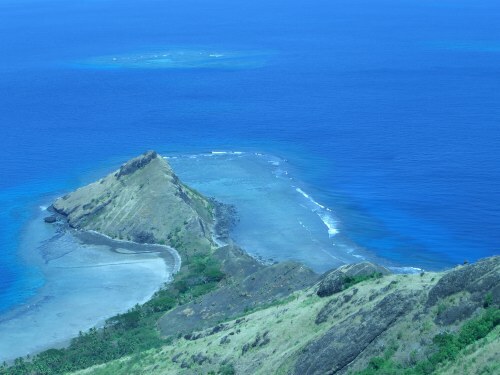 While Joe prowled the village of Yalobi and became a local celebrity, Dennis and I cast our fates to Mob, a grim last minute stand-in for our scheduled guide, to climb above the village on Batinariba, a peak of computer-generated lush green and basalt and the highest point in the Yasawa Islands. Mob’s syntax was spare and basic. He seemed certain that he’d landed a quick and effortless $30, and he looked genuinely surprised each time we answered his question, “You go down?” with “No, we go up.” At a saddle, 1200 feet above the ocean, with an expansive view of Loto Point stretching out in a thin spine to the West, Mob said, “More peanuts,” which we quickly relinquished. Mob had a very big and sharp machete. Later, after a short snorkel, as we fought over the shiniest shells on the beach, we watched people from the touring Captain Cook Cruises schooner, being rowed ashore to a formulated authentic native dance and trinket sale event. We explored and relaxed alone or collectively, Joe visiting a church service on a neighboring island, Dennis beach-combing, me holding the hammock down. We ventured along the beach and around Loto Point and “reef walked,” an activity Dennis had envied of local seafood gatherers on our sailboat passage. Small black and spiny starfish waved at us like long lost loved ones and runt-sized octopusi inked our feet as we trespassed on their private rocks. The following day, John would motor us all ($10 Fiji money each) back to the same area to dive with legions of reef fish among huge mushroom corals and through dark canyons. We would later ride with John to a reef on an adjoining island where brilliant white and lime green cauliflower coral joined the silly colored fish. Sipping tea or Fiji Bitter on Adi’s deck at the margin between lawn and beach in the late afternoon, we watch children, out of school for winter break, play happily on slides made of logs, or sit for hours in a game that requires only a few seed pods to toss. They collect shells to sell and have little meetings on the beach. Next week, all the children of school age will be in boarding schools, doing lessons in English, away from their parents between the coveted weekends. This is how we Fijied. You may do your own Fiji. Just go there and make it so. Kenny Rodgers broke the spell, his sage poker advice resounding on all levels, inside and out, of the Yasawa Flyer. Fellow passengers came into focus, most of whom were probably just trying to have a good time like we were. But my selfish condition painted them crass and unenlightened. A very tall shark fin behind the boat galvanized the group. We had all been in those waters for several days. My stern posture softened and I let a little more Fiji soak in.